Beeman has fielded a lot of questions from customers about the potential danger of handling lead pellets. We can attest to that because we (Straight Shooters) get many of the same questions. And the answer is that as long as pellets are not placed in one's mouth and as long as the shooter washes his/her hands after a shooting session, lead pellets pose little if any health hazard. However, regardless of the answer, many shooters just aren't very comfortable with handling lead pellets and even less so about having them in their yards after shooting. So H&N came up with the idea of having a "low-lead-contact" pellet. Made for shooters who want to minimize their contact with lead H&N took the standard FTS pellet, and coated them with a copper covering. This copper cover is very thin but keeps one's fingers away from the lead of the pellet. The covering is so thin that it doesn't affect the accuracy of the pellet yet minimizes the shooter's exposure to lead. So a customer now has available a great option to be able to get the power of the lead pellet without the exposure to it. You'll want to try these pellets. They are slightly different in weight, but all other characteristics are the same as the original FTS pellets. In addition they are excellent for keeping your gun's bore much cleaner because there is no lead dust left behind in the bore. Silver Stings are one of the most popular pellets in Beeman's line due to the simple design that produces results out in the field. This pellet has a larger waist and outstanding balance that provides greater stability and better air flow than thinner waisted copies. Much of its energy is efficiently retained at 30 yards and beyond. The gentle slope of the rear side of the pellet results in a pellet shape that produces less turbulence than the sharply undercut head found on other brands. The Benjamin round nose pellet caries the quality of the Crosman pellets to the .25 caliber rifles. Weighing in at the upper end of medium the pellets will provide the opportunity for excellent in most .25 air guns. These are high quality, precision, heavy weight pellets which will preform well for long range shooting. The Benjamin are designed to complement the power and accuracy of medium to magnum powered PCP air guns although these premium pellets can enhance the performance of any and all pcp power airguns. The Benjamin Sheridan Cylindrical was designed for shooters who wanted a heavy pellet with exceptional energy retention. The unique shape of this pellet makes it a good choice for the big magnum air guns. Built with the Crosman attention to detail and consistency the Benjamin Sheridan Cylindrical pellet will please you while worrying your pests with it's massive energy retention. The Premier Ultra Magnum is a heavy weight, hard hitting hunting pellet and is best used in powerful spring, gas ram or PCP rifles. These pellets are built to Crosman's uncompromising standards and yield excellent results in many air rifles. Available in 500 quantity tins. While not as consistent in weight as the boxed premier pellets they are an excellent alternative for those looking for the Crosman quality and a lower price point. The finest grade of pellets Crosman has ever manufactured. In fact, it's one of the first choices for Field Target competitors everywhere in the U.S. All Crosman Premiers come packed in sturdy tins to minimize pellet deformation. This is an excellent pellet to try in all rifles and pistols along with other round headed pellets. The Eun Jin pellet is designed for the heavy hitting guns such as the Air Force Condor, Eun Jin Sumatra and Evanix series of guns. This pellet is for use in hunting guns and packs a hit that is unmistakable. The Exact King is JSB's entry into the .25 caliber market. This pellet maintains the quality of previous JSB pellets with consistency of quality and hard hitting power. The round headed design makes the pellet more stable and aerodynamic for the power of the big .25 caliber air rifles. Shooters interested in finding a pellet which groups well with a particular airgun should be sure not to overlook testing this pellet. The Exact King Heavy is JSB's newest pellet in the .25 caliber market. This pellet maintains the quality of previous JSB pellets with consistency of quality and hard hitting power. The round headed design makes the pellet more stable and aerodynamic for the power of the big .25 caliber air rifles. Shooters interested in finding a pellet which groups well with a particular airgun should be sure not to overlook testing this pellet. The Exact King MKII Heavy is JSB's newest pellet in the .25 caliber market. This pellet maintains the quality of previous JSB pellets with consistency of quality and hard hitting power. The round headed design makes the pellet more stable and aerodynamic for the power of the big .25 caliber air rifles. The MKII differs from the standard JSB King Heavy with a longer skirt and slightly smaller diameter body. Shooters interested in finding a pellet which groups well with a particular airgun should be sure not to overlook testing this pellet. Customers have reported this pellet working well in the more powerful .25 air rifles such as the Rapid Air Weapons HM1000x, Hatsan BT65 QE and FX Bobcat. 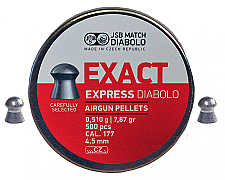 The Air Arms Diabolo Express is the newest pellet from Air Arms and features the same high quality as the ever popular Air Arms Diablo. The weight is slightly lower than the standard Diabolo however and should result in a slightly flatter trajectory in medium powered air rifles. The .177 Express weighs in at 7.9 grain. These are definitely pellets worth trying in all air rifles but especially in medium powered air guns. Head size 4.52. This is one of the most popular additions to our pellet line-up and is definitely a winner. It ranks right up there with the Crosman Premier and Beeman FTS as potential field target pellets. The round headed design makes the pellet more stable and aerodynamic at longer distances. Shooters interested in find a pellet which groups well with a particular airgun should be sure no to overlook testing this pellet. Head Size 5.51. The Air Arms Diabolo Field is Air Arms entry into the .25 caliber market. This pellet maintains the quality of JSB (manufacturer) pellets with consistency of quality and hard hitting power. The round headed design makes the pellet more stable and aerodynamic for the power of the big .25 caliber air rifles. Shooters interested in finding a pellet which groups well with a particular airgun should be sure not to overlook testing this pellet. Head size 6.35. 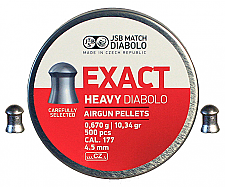 The Air Arms Diabolo Field Heavy .177 caliber is one of the most popular additions to our air rifle pellet line-up and is definitely a winner. It ranks right up there with the JSB Heavy and H&N FTT as potential field target pellets. The round headed design makes the pellet more stable and aerodynamic at longer distances. Shooters interested in find a pellet which groups well with a particular airgun should be sure no to overlook testing this pellet. Head size 4.52. The Air Arms Diabolo Field Heavy .22 caliber is one of the most popular additions to our air rifle pellet line-up and is definitely a winner. It ranks right up there with the JSB Exact Heavy and H&N FTT as potential field target pellets. The round headed design makes the pellet more stable and aerodynamic at longer distances. Shooters interested in find a pellet which groups well with a particular airgun should be sure no to overlook testing this pellet. Head size 5.52. Heavy, very accurate pellet for long ranges. First-class, aerodynamic design for high impact and penetration. Tight shot groups. Lowest rate of lead fouling and consistent shot spreads thanks to special alloy and lubrication. This is one of the top pellet choices for new airguns. Look seriously at this pellet if you shoot a supermagnum airgun. The Baracuda has a smooth skirt design. Note: The weight on the tin is incorrect. The correct weight is as shown below. Extra heavy, very accurate pellet designed for use in high powered PCP air rifles. Excellent for long range shooting and hunting.. First-class, aerodynamic design for high impact and penetration. Tight shot groups. Lowest rate of lead fouling and consistent shot spreads thanks to special alloy and lubrication. This is one of the top pellet choices for PCP .177 airguns. Look seriously at this pellet if you shoot a supermagnum airgun. The Baracuda Magnum has a smooth skirt design. As one of the world's heaviest pellets, the Baracuda (Beeman Kodiak) has a tremendous amount of inertia that delivers super impact on those "hard to knock down" targets. The great weight also provides good wind resistance and is more efficient in the higher powered spring airguns and especially in the pre-charged pneumatics. The head is conical in shape, providing outstanding aerodynamic performance. This is one of the top three pellet choices for new airguns. Look seriously at this pellet if you shoot a supermagnum airgun. As one of the world's heaviest pellets, the Baracudahas a tremendous amount of inertia that delivers super impact on those "hard to knock down" targets. The great weight also provides good wind resistance and is more efficient in the higher powered spring airguns and especially in the pre-charged pneumatics. The head is conical in shape, providing outstanding aerodynamic performance. This is one of the top three pellet choices for new airguns. Look seriously at this pellet if you shoot a supermagnum airgun. Super-light, non-lead pellet. For best results, use in a light powered air rifle or air pistols. Lead-free pellets tend to be rather light for medium and high powered airguns. But don't overlook them if you're target shooting with a PCP that has adjustable power such as the Air Arms S500 or S510. Just turn the power way down as you would when using any light-weight pellet. A unique design from Haendler & Natermann. 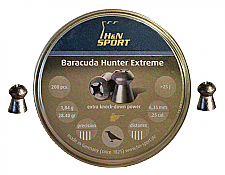 The Hunter Extreeme is a heavy weight, exceptionally accurate hunting pellet for long range use. The design includes a deep, crossshaped hollow tip for tremendous shock effect and rapid energy transfer (expansion). Great aerodynamic properties for high accuracy and a heavy weight for true flight even with wind so common in the field. This is a heavy, exceptionally accurate hunting pellet for long ranges. It's advanced development of the Baracuda design yields the best aerodynamic properties for maximum impact, high penetration and controlled deformation of pellet. The Hunter pellet will give tight shot groups in many rifles. The pellet is smooth with a deep hollow point. As one of the world's heaviest pellets, the Kodiak has a tremendous amount of inertia that delivers super impact on those "hard to knock down" targets. The great weight also provides good wind resistance and is more efficient in the higher powered spring airguns and especially in the pre-charged pneumatics. The head is conical in shape, providing outstanding aerodynamic performance. This is one of the top three pellet choices for new airguns. Look seriously at this pellet if you shoot a supermagnum airgun. As one of the world's heaviest pellets, the Baracuda Match (Beeman Kodiak) has a tremendous amount of inertia that delivers super impact on those "hard to knock down" targets. The great weight also provides good wind resistance and is more efficient in the higher powered spring airguns and especially in the pre-charged pneumatics. The head is conical in shape, providing outstanding aerodynamic performance. This is one of the top three pellet choices for new airguns. Look seriously at this pellet if you shoot a supermagnum airgun. Heavy, exceptionally accurate pellet for long ranges. No lead-fouling, improved drive in barrel, no contact with lead thanks to special copper coating (20% harder than comparable lead pellets). First-class aerodynamic design for high impact and penetration. Low deformation of pellet. Tight shot groups. Smooth skirt. If you are shooting a medium-high to magnum powered air gun you need to give this pellet a try. It is accurate, hard hitting and great for medium to long range shooting. As one of the world's heaviest pellets, the Baracuda Power (Kodiak Double Gold) has a tremendous amount of inertia that delivers super impact on those "hard to knock down" targets. The great weight also provides good wind resistance and is more efficient in the higher powered spring airguns and especially in the pre-charged pneumatics. The copper covered head is conical in shape, providing outstanding aerodynamic performance. This is one of the top three pellet choices for new airguns. Look seriously at this pellet if you shoot a supermagnum airgun. The Crow Magnum pellet was designed for shooters who want a heavier hollow point with a gigantic forward expansion cup. A key objective of the new design was to provide exceptional stability, and thus medium range accuracy for the higher power adult airguns on the market. The Crow Magnum is a great pellet for medium to magnum powered air rifles or pistols where your distance is 30 yards or less. The Crow Magnum pellet was designed for shooters who wanted a heavier hollow point with a gigantic forward expansion cup. A key objective of the new design was to provide exceptional stability and thus long range accuracy for the higher power adult airguns on the market. A yawning mouth and greater forward weight was included resulting in one of the world's most accurate field pellets. In independent testing, a .25 caliber Crow Magnum pellet recovered from a feral pigeon had nearly doubled in size to .41 caliber when shot at 25 yards! Easily one of the most unique pellets we have ever designed, the Crow Magnum was bestowed a Product Award of Merit by American Firearms industry magazine. The Crow Magnum pellet was designed for shooters who want a heavier hollow point with a gigantic forward expansion cup. A key objective of the new design was to provide exceptional stability, and thus medium range accuracy for the higher power adult airguns on the market. The Crow Magnum is a great pellet for medium to magnum powered air rifles. As is the case with all round nosed pellets, the FTT is designed for accuracy at longer ranges whether hunting or target shooting. Made in the tradition of other Haendler & Natermann pellets and you can expect quality and consistency from this pellet. The H&N FTT ranks as one of the first pellets we try in any new airgun. As is the case with all round nosed pellets, the FTT pellets are designed for accuracy at longer ranges whether hunting or target shooting. Made in the tradition of other Haendler & Natermann pellets and you can expect quality and consistency from this pellet. The H&N FTT ranks as one of the first three pellets we try in any new airgun. The FTT is a medium-weight, extremely accurate competition pellet with a flat trajectory for medium to long ranges. It has an exceptional aerodynamic design which yields high impact and penetration as well as tight shot groups. It has a low rate of lead fouling and thanks to special alloy and lubrication gives consistent shot spreads. This is one of the first pellets we try in all guns, especially the Weihrauch rifles. As is the case with all round nosed pellets, the H&N Field Target Trophy is designed for accuracy at longer ranges whether hunting or target shooting. Made in the tradition of other Haendler & Natermann pellets and you can expect quality and consistency from this pellet. The H&N Field Target Trophy ranks as one of the first three pellets we try in any new airgun. It also yields tight shot groups as well as the lowest rate of lead fouling. And consistent shot spreads thanks to special alloy and lubrication. This is a lead-free, lightweight high-velocity pellet with exceptional accuracy for general shooting and pest control. It's light weight allows for a very flat trajectory at medium ranges. And the non-lead format means no lead-fouling, improved drive in the barrel and no contact with lead thanks to special tin alloy. This pelle is very smooth shooting with high impact. The lead-free pellets are best suited to lighter powered rifles such as the Beeman R7, Weihrauch HW30S and HW50S as well as air pistols. 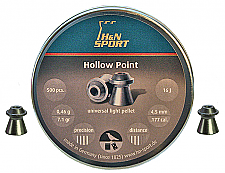 The H&N Field Target Power is a round nose copper coated pellet. This medium-weight, extremely accurate pellet with flat trajectory for long ranges. No lead-fouling, improved drive in the barrel, no contact with lead thanks to special copper coating (20% harder than comparable lead pellets). Exceptional aerodynamic design for high impact and improved penetration. Tightest shot groups. The FTT is a medium-weight, extremely accurate competition pellet with a flat trajectory for medium to long ranges. It has an exceptional aerodynamic design which yields high impact and penetration as well as tight shot groups. It has a low rate of lead fouling and thanks to special alloy and lubrication gives consistent shot spreads. This is one of the first pellets we try in all guns, especially the Weihrauch rifles. The FTT Power sports a copper coating. The H&N Hollow Point was the very first hollow point airgun pellet ever designed, and remains popular to this day. A two year development stage resulted in pellet that really expands when used in magnum air rifles. It just gets larger and larger on impact! Even guns of power can benefit from the design of the forward cup which allows for maximum impact even at velocities too low for expansion. The unique head also has a sharp edge that can cut a clean hole in a paper target or catch the edge of a silhouette. In fact, it could be considered a semi-wadcutter. Due to it's lighter weight, it is an excellent pellet to try in the lighter powered airguns. The Hollow Point was the very first hollow point airgun pellet ever designed, and remains popular to this day. A two year development stage resulted in pellet that really expands when used in magnum air rifles. It just gets larger and larger on impact! Even guns of lower power can benefit from the design of the forward cup which allows for maximum impact even at velocities too low for expansion. The unique head also has a sharp edge that can cut a clean hole in a paper target or catch the edge of a silhouette. In fact, it could be considered a semi-wadcutter. Extremely accurate competition and training pellet for performance-oriented shooters. Tight shot groups, clean-cut holes make this the ideal paper target pellet. The H&N Match Rifle pellet provides excellent value for the money. The H&N Match has a smooth skirt. This is a great pellet to use in air pistols and light powered air rifles. The Rabbit Magnum is a heavy pellet for hunting and pest control. This hard hitting is best used in magnum powered air rifles. Unique aerodynamic torpedo design for maximum stability and retention of power at longer ranges. Maximum possible impact and maximum penetration and characteristics of the Rabbit Magnum. Low rate of lead fouling and consistent shot spreads thanks to special alloy and lubrication. 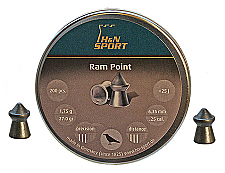 Built to the high quality of all Haendler & Natermann pellets the H&N Ram Point is a heavy weight, pointed hunting pellet. Known for high impact and penetration the pointed design of the Ram Point is very effective at short to medium range shooting. The Ram Point is a smooth pellet with a sharp edge that makes it both effective for hunting and cutting clean holes in paper. The Silver Point is a heavy pellet for use with the most powerful airguns. Although the heavy weight will lower the velocity, they shoot with greater stability and impact than lighter weight pointed pellets. The triple rings seal the pellet in the bore helping to lessen in-flight wobble. The Silver Point is best used in short to medium distances where maximum penetration and shock are desired. The Sniper Magnum is heavy counterpart of the Sniper Light and Medium. It is used primarily for hunting and long ranges. Like the Sniper Light and Medium, the pellet’s special shape reduces drag, which results in a flat trajectory. The H&N Sniper Magnum is designed to be a long range hunting pellet. A heavy, exceptionally accurate hunting pellet for all kinds of game at long ranges. The pellet's special barrel shape reduces drag, which results in a flatter trajectory and an excellent downrange accuracy. The Sniper Medium, like the Light, is a barrel-shaped high-velocity competition and hunting pellet. It is designed for field target, hunter field target and hunting. Best used in air rifles that meet or exceed 12 foot-pounds of muzzle energy. The special shape of the pellet reduces the drag and thus ensures a flat trajectory. The JSB Exact .177 caliber is one of the most popular additions to our air rifle pellet line-up and is definitely a winner. It ranks right up there with the Crosman Premier and Beeman FTS as potential field target pellets. The round headed design makes the pellet stable and aerodynamic at longer distances. Shooters interested in finding a pellet which groups well with a particular airgun should be sure not to overlook testing this pellet. The JSB Exact .177 Heavy caliber is one of the most popular additions to our air rifle pellet line-up and is definitely a winner. It ranks right up there with the Crosman Premier and Beeman FTS as potential field target pellets. The round headed design makes the pellet more stable and aerodynamic at longer distances. Shooters interested in find a pellet which groups well with a particular airgun should be sure no to overlook testing this pellet. This is one of the most popular additions to our pellet line-up and is definitely a winner. It ranks right up there with the Crosman Premier and Beeman FTS as potential field target pellets. The round headed design makes the pellet more stable and aerodynamic at longer distances. Shooters interested in find a pellet which groups well with a particular airgun should be sure no to overlook testing this pellet. The JSB Exact .22 Heavy caliber is one of the most popular additions to our air rifle pellet line-up and is definitely a winner. It ranks right up there with the Crosman Premier and Beeman FTS as potential field target pellets. The round headed design makes the pellet more stable and aerodynamic at longer distances. Shooters interested in find a pellet which groups well with a particular airgun should be sure no to overlook testing this pellet. 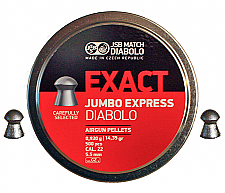 The Exact .30 is another premium quality hunting pellet from JSB. This pellet utilizes the standard Exact Domed shape for unsurpassed performance on small game. Whether ridding your garden of unwanted pests or stalking your favorite hardwoods in search of squirrel, experience excellent accuracy and efficiency when hunting with premium Domed hunting pellets. The Exacts were designed to be the most effective and efficient airgun hunting ammunition available. The Exact .30 Heavy is another premium quality hunting pellet from JSB. This pellet utilizes the standard Exact Domed shape for unsurpassed performance on small game. Whether ridding your garden of unwanted pests or stalking your favorite hardwoods in search of squirrel, experience excellent accuracy and efficiency when hunting with premium Domed hunting pellets. The Exacts were designed to be the most effective and efficient airgun hunting ammunition available. The Exact .35 is another premium quality hunting pellet from JSB. This pellet utilizes the standard Exact Domed shape for unsurpassed performance on small game. Whether ridding your garden of unwanted pests or stalking your favorite hardwoods in search of squirrel, experience excellent accuracy and efficiency when hunting with premium Domed hunting pellets. The Exacts were designed to be the most effective and efficient airgun hunting ammunition available. The JSB Express is the newest pellet from JSB and features the same high quality as the ever popular JSB Exact. The weight is slightly lower than the standard Exacts however and should result in a slightly flatter trajectory in medium powered air rifles. The .177 Express weighs in at 7.9 grain and the .22 at 14.3 grain. That means that they are the same weight as the Crosman Premiers but retain a higher energy level at longer distances. These are definitely pellets worth trying in all air rifles but especially in medium powered air guns. The JSB Express is the newest pellet from JSB and features the same high quality as the ever popular JSB Exact. The weight is slightly lower than the Exacts however and should result in a slightly flatter trajectory in medium powered air rifles. The .177 Express weighs in at 7.9 grain and the .22 at 14.3 grain. That means that they are the same weight as the Crosman Premiers but retain a higher energy level at longer distances. These are definitely pellets worth trying in all air rifles but especially in medium powered air guns. The JSB Exact Monster .22 is a new twist on an old pellet. The cylindrical shape has been around for years and proven the design as a long range hunting pellet. As a heavy weight pellet it will hold its energy downrange which makes it ideal for hunting and pest control. The JSB Monster is a must try pellet if you are shooting one of hte super magnum pcp air rifles. It is not suited for low to medium powered airguns. The patented Predator Polymag is a premium quality hunting pellet which combines a hollow head with a sharp polymer tip for unsurpassed performance on small game. Whether ridding your garden of unwanted pests or stalking your favorite hardwoods in search of squirrel, experience excellent accuracy and efficiency when hunting with premium Predator Polymag hunting pellets. The hollow head with sharp polymer tip delivers maximum penetration and shock to vital organs. With instant expansion on impact, the Predator Polymag cuts and shatters bone on contact. Offering excellent flight characteristics, the high ballistic coefficient allows for higher retained velocity and flat trajectory. The Predator Polymag allows the hunter to take game efficiently with match grade accuracy. For shooters who cannot or choose not to shoot traditional lead pellets JSB has introduced their new GTO series. The GTO .22 caliber is a lead free pellet. JSB has not only spent a tremendous amount of time testing these pellets at their JSB facility but have sent the pellets out to a multitude of everyday shooters for their feedback. Without exception each has given the GTO pellets their highest accuracy performance ratings. Despite the GTO being slightly lighter than traditional lead pellets the test shooters were all surprised their guns required no adjustments to handle the GTO pellets. Concerned parents, pest control experts and those with environmental concerns or regulations should give the GTO pellets a try. With the growing demand for lead free pellets JSB has invested time, money and manpower to provide a high quality lead free pellet with the proven performance for today airgunners. For shooters who cannot or choose not to shoot traditional lead pellets JSB has introduced their new GTO series. The GTO .25 caliber is a lead free pellet. RWS Hobby Pellets offer the uncompromising guarantee of quality you'd expect from RWS, at great prices. RWS Hobby Pellets are the equal of many higher priced pellets and produce high velocity as well as accuracy at short to medium airgun ranges. These pellets were designed primarily as a practice/plinking pellet. We recommend that they be used in light and medium powered air rifles. RWS Meisterkugeln Pistol Pellets, due to considerable refinement in production techniques have become even higher in quality than ever. New material composition and surface treatments give the pellet a permanently bright, shiny appearance and slow oxidation. Dimensional accuracy and adherence to strict weights in production are subject to constant controls. The Meisterkugeln Pistol pellet, with it's light 7.0 weight is ideal for airgun pistols of all types. The lighter weight yields higher velocities without sacrificing accuracy. Extensive research and development have led to the special procedures incorporated in the production of R-10 Pellets. Utilizing Optoelectronic Scanning to inspect and measure each pellet, Dynamit-Nobel has set new standards for pellet manufacturing. Before introducing the R-10 to the world, Dynamit-Nobel subjected these pellets to the most rigorous testing procedures known. Professional shooters shot thousands of rounds and offered invaluable information to the engineers. As a result of this type of input, we feel the RWS R-10 pellet is the finest pellet available to the shooting fraternity. We recommend the slightly heavier 8.3 grain for rifles over 12 fpe and the 7.0 grain for rifles 12 fpe and under. The 7.0 grain also would work well with all pistols. R-10 PELLETS PROVIDE CONSISTENT WORLD CLASS PERFORMANCE. 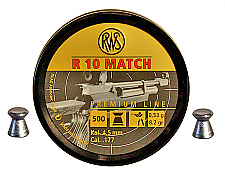 The RWS Super-H-Point is a hollow point pellet in the medium to light weight range. The Super-H-Point pellet provides very good expansion in light to medium powered air guns. 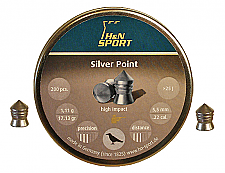 The Super-H-Point pellet was especially developed for field use and is able to deliver a shocking blow to small game. It's light weight also makes it a good choice for light and medium powered airguns. The RWS Superdome is a round nose (domed) pellet. The Superdome in a light to medium weight pellet that works well in light to medium powered air guns and many of the standard magnum powered pcp air rifles. Manufactured with the same high quality and accuracy characteristics as all RWS pellets. The Superdome is ideal for target practice, hunting, pest control and general use. The RWS SuperMag is a heavy wadcutter pellet that was designed for the more powerful magnum airguns. Ideal where clean holes in paper are required or low penetration for pest control is an asset. This pellet would be a good choice for rifles with a power level greater than 12 fpe. As with any wadcutter 10 meters is the ideal range but eh heavy weight of this pellet will allow a slightly longer range for performance. The name really says it all. The RWS Superpoint pellet was designed primarily for field use in hunting and pest control. Its high velocity, sharply pointed head and light weight give this pellet truly amazing penetration. The RWS Superpoint is best suited to light and medium powered air rifles. The recommended shooting distance for pointed pellets is 25-30 yards and shorter. The name really says it all. The RWS Superpoint pellet is a light weight point pellet. The SuperPoint was designed primarily for field use in hunting and pest control applications. The high velocity, sharply pointed head and light weight give this pellet truly amazing penetration. The Superpoint is best used in light and medium powered air rifles although even magnum powered rifles may show good performance at shorter distances. We are asked this question all the time and always give the same answer. There is really no way to tell what pellet will work best in your gun without testing all the pellets in that caliber especially the round headed pellets if you have a medium or high powered airgun. That is why we designed the Straight Shooters Ultimate Sampler. It is the most complete pellet sampler available today. Our .177 sampler has now been divided into two separately priced samplers. This kit contains only the round headed .177 caliber pellets. Experience shows that most medium and high powered airguns typically group best with pellets. So we filled this sampler will the best pellets available. Our reusable containers hold 25 each of the selected pellets, all neatly sorted, labeled and ready for use. The Straight Shooters Sampler is a great way to find the best grouping pellets for any airgun. Combine the sampler with a chronograph to check the airgun's velocities with different pellets also. We are asked this question all the time and always give the same answer. There is really no way to tell what pellet will work best in your gun without testing all the pellets in that caliber. That is why we designed the Straight Shooters Ultimate Sampler. It is the most complete pellet sampler available today. Our .22 caliber kit contains popular pellets from the Crosman, Beeman, RWS, JSB, and Benjamin Sheridan.product lines. Our reusable containers hold 25 each of the selected pellets, all neatly sorted, labeled and ready for use. The Straight Shooters Sampler is a great way to find the best grouping pellets for any airgun. Combine the sampler with a chronograph to check the airgun's velocities with different pellets also. This pellet is good for all shooting uses from backyard fun to some small game hunting or pest control. The Vortex Supreme is a medium weight pellet that should perform well in all airguns. Give it a try and see for yourself. Available in .177, .22 and .25 calibers. These pellets are made for superior accuracy and punch. The Vortex Supreme pellet was designed for superior accuracy and punch. And .25 caliber pellets hit HARD!!! So if you're into hunting or pest control be sure to give these pellets a try. Here's the easiest way to clean an airgun barrel between regular cleanings. Just pop these cylindrical, precision cut, heavy felt pellets into the breech of any airgun, and fire them like regular pellets. These dense felt pellets expand to wipe rifling detail clean in seconds. Great for emergency clean-ups in the field or between regular full cleanings using patches and cleaner degreaser. Great for applying solvent or oil to barrels--just squeeze a drop of cleaner degreaser or light polarizing oil onto the felt and shoot. CAUTION: These pellets may produce pain, or even injury, at extremely close ranges. Load two or three cleaning pellets at a time to provide needed resistance on spring/gas spring airguns to prevent harmful piston slam.